This is the final post of this particular series. In my previous post, we set out a framework that allowed us to get a sense of whether our kids lives would be warmed up to the degree that they would be very different from ours. And when I say ‘different’, I don’t mean ‘different’ as in access to different technology, but ‘different’ as in living in a different economic and political world. In many decisions in life, we use simplistic rules of thumb as starting points for decision-making. In the same manner, I have suggested that the Intergovernmental Panel on Climate Change (IPCC)’s benchmark 2 degrees Celsius of warming yardstick (from pre-industrial levels) provides one such rule of thumb: it tells us what degree of warming is likely to have a material impact on food production and economic growth. This has been termed ‘dangerous’ climate change. In a similar vein, ‘extremely dangerous’ climate change has been associated with 3 or 4 degrees Celsius of warming—a degree of warming that would suggest socio-economic instability; that is, the failure of sovereign states, and possibly a reworking of the post-war international political order. Rules of thumb are by definition approximations. We don’t exactly know how resilient world food production will be in a 2-degree warmer world; we don’t know whether economies can grow enough to easily adapt to a 2 degree world—or, indeed, whether it is actually possible to inoculate ourselves against climate change through economic growth as economists such as William Nordhaus suggest (I think not, others would beg to differ, we shall see). What we do know, however, is that a 2-degree world poses an appreciable risk to our welfare. We could blindly go about our everyday lives (as most of us are currently doing) and get lucky: the world economy grows, technology advances, we prove able to cope with climate change, and 2 degrees of warming proves the peak. But then again, may be not. But will we be able to get a better handle on how bad things could get as data comes in over the next decade? The answer to this is ‘yes’ —up to a point, but we will never escape uncertainty entirely. Yet, the human condition is one of decision making under uncertainty. This is why the climate skeptic refrain that we don’t have enough certainty to make any decisions over fossil fuel emissions is so absurd. How much certainty do we have of future outcomes when choosing a college, selecting a spouse or applying for a job? The answer is that we take a stab at future outcomes based on the information currently available. As more information comes in, we can then revise our view of what the future will bring—but we will never achieve certainty. So in the spirit of empowerment, I suggested in my last post that you periodically check to see whether our annual fossil fuel carbon emissions are consistent with a world that will stay within 2 degrees of warming or suggest a world where we overshoot this target. The Carbon Dioxide Information Analysis Center’s advance estimate for 2010 fossil fuel carbon emission was 9.1 gita tonnes of carbon, a 5.9% rise from 2009. Quite simplistically, if this number does not start declining by 2020, then it is extremely unlikely that warming will be kept below 2 degrees (or much worse). Further, if this number continues to grow as the current decade progresses, then we will move into the territory of ‘extremely dangerous’ climate change of 3 or 4 degrees Celsius—or more. Let’s dig a little and see if we can get a better idea of how the CO2 emission number will likely evolve over the coming decade. In my last post I introduced the idea of a carbon budget following the work of Meinhaussen and other scientists and suggested that we had already used up 28% of that budget since 2000. Note though that the precise number should not be given too much weight; rather it is a best estimate of where we are in terms of emissions. Moreover, if we heroically manage to hold emissions at a constant level from now onward, we would run out of our budget by 2030 if a) we wanted a 75% chance of success keeping within 2 degrees of warming and b) reduced emissions to zero the following year after 2030. Two assumptions here are patently unrealistic: first, that near term emission growth will miraculously flat line; and second, that emissions will instantaneously revert to zero at some appointed year. Why? Firstly, because economic growth is highly energy dependent over the near term (and probably mid term as well). As such, we have now entered the realm of economic cause and effect as opposed to physical science cause and effect (for example, the link between atmospheric C02 and global mean temperatures). The correlation between economic growth and energy has long been known, but is not necessarily truly appreciated. Indeed, many scholars now believe that the industrial revolution was as much a fossil fuel energy revolution (for example see here) as opposed to a pure technology (hard technology such as James Watt’s steam engine and soft technology as in such capitalist corner stones as the joint stock company). If there had been no available coal (and later oil), there would have been no industrial revolution—and no miraculous jump in GDP growth and associated living standards. The degree of correlation between growth and energy, however, can shift through time. Moreover, the correlation between energy and CO2 emissions can also alter with the years. Thus, we have a three-step process: moving from GDP growth, to energy production growth, to CO2 emissions growth. More specifically, an advanced serviced orientated economy may be able to grow with little increase in energy inputs (although frequently we find that this is because they have, in effect, outsourced their energy needs to less-developed countries who make solid ‘stuff’ that complements the services the advanced countries provide). In addition, this advanced service economy may be able to fulfill what little additional energy needs it has through developing sustainables such as solar and wind that produce minimum (at least explicitly) CO2 emissions. If we put the developed countries and less-developed countries together, we get a sense of the dependency of global GDP to carbon emissions. 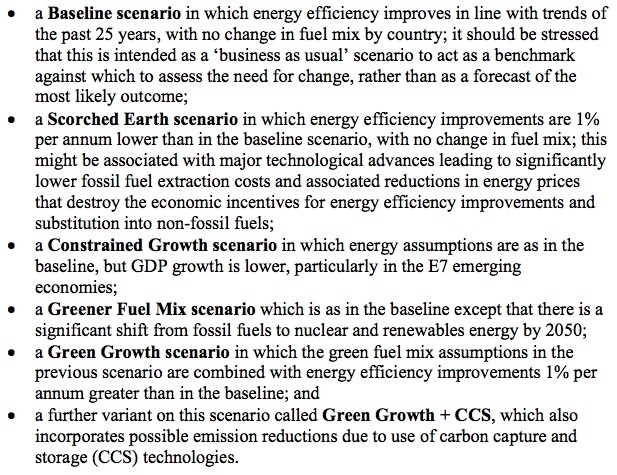 PWC put out a report in 2006 which looked at the relationship between growth and carbon and then mapped out possible future scenarios (here). 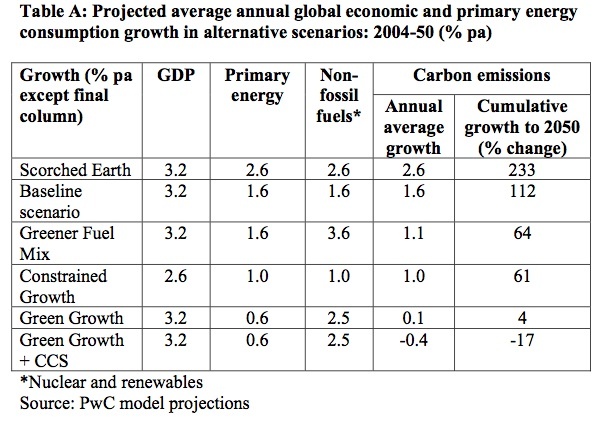 Note that since the PWC report was published in 2006. the link between carbon emissions and GDP has followed a path a little bit worse than the ‘Baseline’ scenario. So what happens if we continue on a path of relatively strong global growth (even if there is meagre growth in OECD countries) and relatively little success in decarbonisation (following on from the failure of the Copenhagen talks to come up with hard global goals on carbon emission mitigation)? The United Nations Environment Programme (UNEP)’s “The Emissions Gap Report” provides some answers. It builds on the carbon budget concepts discussed in my last post and highlights the choice between achieving an early peak in carbon emissions and a slow decline, and a late peak in carbon emissions and a rapid decline. 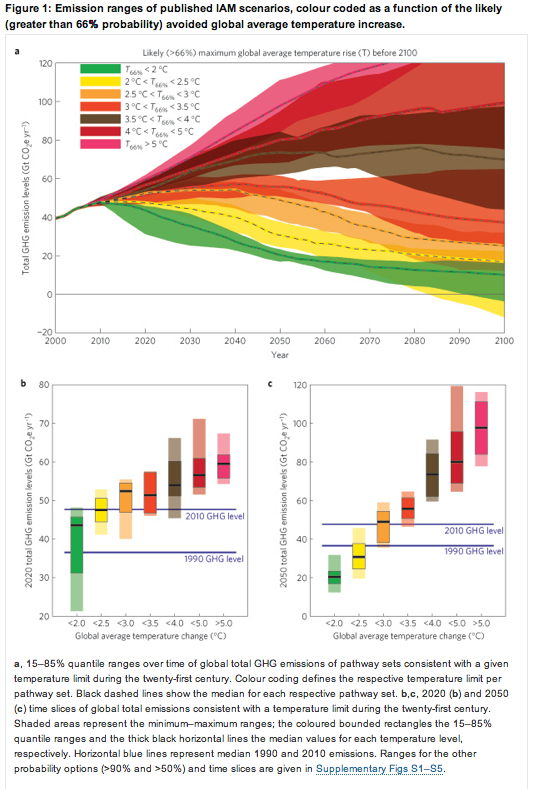 The report then goes on to look at what emissions need to look like in the year 2020 if we wish to hold global mean temperature rise from pre-industrial levels to 2 degrees Celsius of warming (what they term a ‘likely’ chance of success). They use 2005 as their base year, when a total of 45 giga tonnes of CO2 equivalent was emitted. Note the use of CO2 equivalent. The term means CO2 emissions plus emissions of other non-greenhouse gases translated into equivalent CO2 units. This is a different unit of measure than that found at the Carbon Dioxide Information Analysis Center (CDIAC) web site that I referred to in my last post (they focus on giga tonnes of carbon) and is different than the units the International Energy Agency (IEA) uses in its reports (they look at giga tonnes of CO2). We will return to this issue a little later, so let us stay with CO2 equivalent, or CO2-eq. The first thing to note in the chart above is that the best estimate of having a 66% chance of keeping within the 2 degree limit requires CO2-eq emissions to be actually less than 2005 levels by 2020. How realistic is that? Looking at the alternative scenarios, the answer must be: “it isn’t realistic”. Business as usual sees us a whopping 11 giga tonnes of CO2-eq above the required target (25% above), while even the strict observance of binding pledges sees an overshoot. So if we are likely to wander into the realm of ‘dangerous’ climate change what is the likelihood of us getting into the even worse situation of ‘extremely dangerous’ climate change where our kids’ lives could be transformed? Building on the UNEP’s analysis, an academic paper by Joeri Rogelj and co-authors in the journal Nature throws some light on this question (see here). They model a series of emission pathways consistent with a 66% probability of staying within a particular temperature increase based on the spread of sensitivity of temperature to CO2. Remember, if we get lucky, temperature could turn out to be less sensitive to a doubling of CO2 than our best estimate of 3 degrees; if we are unlucky, it could turn out to be more sensitive. In the former case, we can get away with emitting more CO2; in the latter case, less. Unfortunately, we won’t get a better handle on which sensitivity is correct for a decade or two, by which time any CO2 emitted into the atmosphere will stay there for hundreds of years—and warm the earth for hundreds of years. The Rogelj paper, therefore, provides a road map of where various emission paths of CO2-eq will take us temperature rise, with sign posts for the year 2020 and 2050. For a larger image, you can click on this link to the chart from the original article. Now 2050 is a long way away, but 2020 is less than a decade. Moreover, given the inertia in energy production systems (you can’t replace coal powered power stations with renewables overnight) you can get a sense of where we will be in 2020 by just seeing whether current emissions growth is decelerating, accelerating or staying the same. So let’s look at this signpost in more detail (click on the table for a larger image). In column three of the table above, the central number is the median estimate of C02 emissions in the year 2020 that are consistent with a peak in global mean temperature given in the left hand column. So for us to stay within 2 degrees of warming with a 66% probability, we would need to limit CO2-eq emissions to 44 giga tonnes in 2020, one giga tonne less than we emitted in 2005. What about for ‘extremely dangerous’ climate change of 3 degrees of warming? The median emission given for this limit is 52 giga tonnes, 7 giga tonnes above 2005. Unfortunately—and this goes back to my frustration with the dog’s dinner of units that the scientific community uses for climate change publications—there isn’t a readily accessibly and timely updated source of CO2-eq data. However, given that we are interested in changes, this doesn’t really matter. So let us use 2005 as our base year and see what fossil fuel carbon emissions were in that year according to the CDIAC (see here). You can find that in 2005 a total of 8.1 giga tonnes of carbon was emitted. 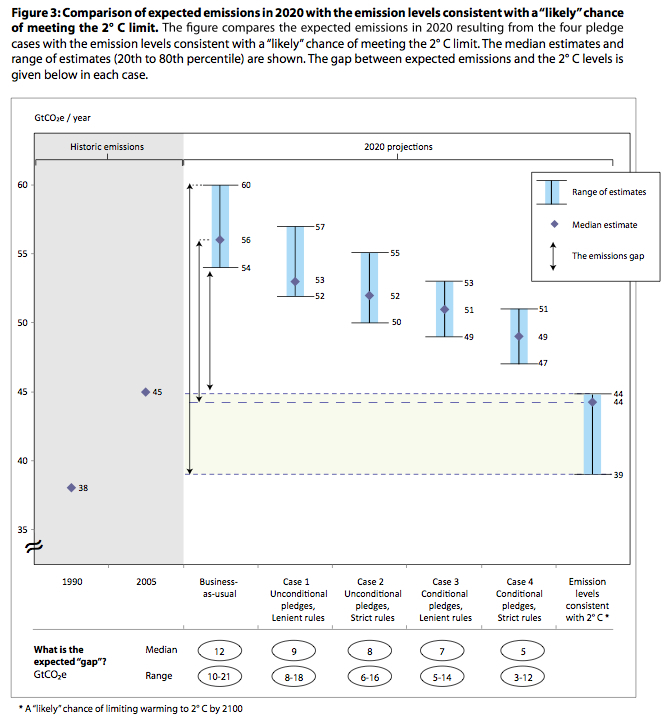 In 2010, the CDIAC’s advance estimate has the world emitting 9.1 giga tonnes of CO2. So in the past five years, carbon emissions have increased by 1 giga tonnes. Extrapolating that growth rate, we could then make a quick and dirty estimate that carbon emissions will rise by another 2 giga tonnes by 202o, making a grand total of 3 extra tonnes of carbon emissions over our 2005 base year. Now we have to translate carbon emissions into CO2 emissions by weight, remembering from the last post that the CO2 molecule is 3.667 times heavier than a single carbon atom. That means that CO2 emissions will be 11 giga tonnes higher in 2020 than 2005. Now let’s be conservative and assume that non-CO2 greenhouse gases flatline over this period (in reality, atmospheric concentrations of these gases will likely rise a bit), so the 11 giga tonnes increase in CO2 from 2005 to 2020 will be the same thing as an 11 tonnes rise in CO2-eq for the period. Put that figure on top of our starting amount of 44 giga tonnes of CO2-eq in 2005 gives us 55 giga tonnes of CO2-eq emissions in 2020. And 55 giga tonnes of CO2 emissions in 2020 is consistent with a CO2 emissions pathway that leads us to 5 degrees of warming. This, in turn, is in line with UNEP’s base line scenario. True, we could get lucky even if we are emitting 55 giga tonnes of CO2-eq in 2020 (although it is unlikely that this luck will allow us to defend the 2 degree target, or even higher). Temperature could prove less sensitive to CO2 than our current best estimate. Some miraculous technology could appear within a decade or two that allows us to decarbonise energy production at a breakneck pace. But this is a blog about risk—and unfortunately there is an appreciable risk that our current emissions path will cook our kids. And to come to that conclusion, you don’t need to rely on the word of others. Just look at the data yourself: the key numbers are all here. This entry was posted in Climate Change and tagged CDIAC, climate risk, IEA, Rogelj, The Emissions Gap Report, UNEP. Bookmark the permalink.